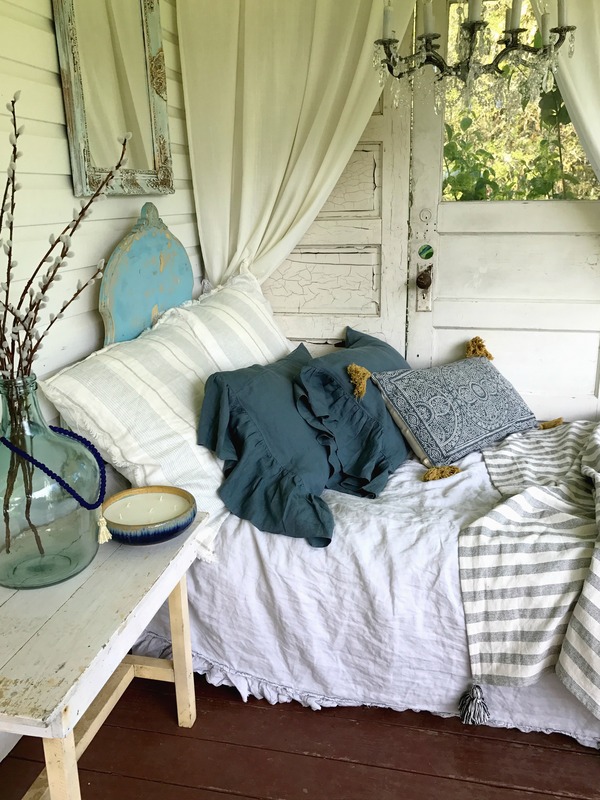 I added some Bohemian Style to the farm with 3 tips to master bohemian style decor. Picking your textiles is a very important part in mastering the Bohemian Style. Getting the ideal pillows, curtains, and throw blankets is very simple. Lighting is also big because it can create the feel of the space. By picking those perfect decor pieces it can set your home apart from the rest. These three tips are great in getting started to create your perfect Bohemian Style! Patterns are what makes the Bohemian style. I love having soft, solid colored linen pillows paired with prints for an easy contrast. 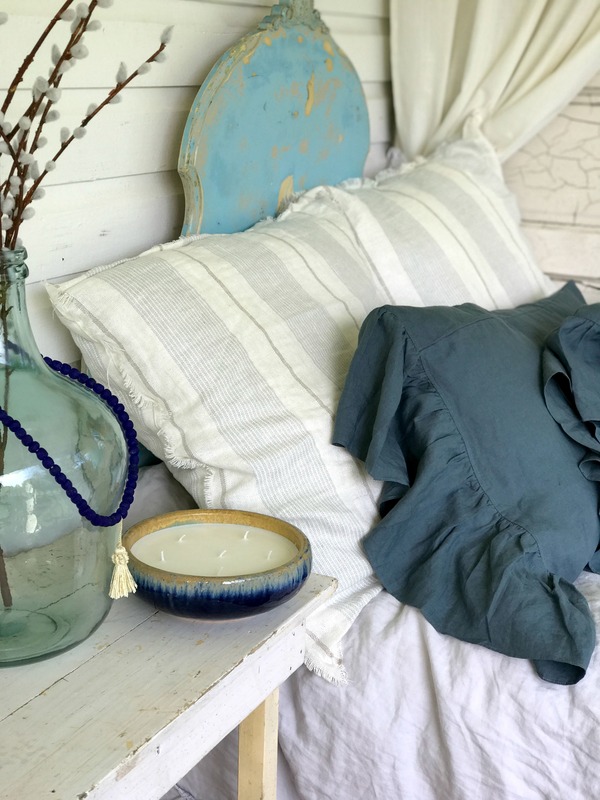 Shop linen pillows here. By adding a couple accent pillows it can make the space really pop! Adding a patterned throw blanket on top is easy for Bohemian Style. Mixing the patterns of your textiles is what it’s all about. Lighting is important in your Bohemian space. It can be very dark, or light and open. In my case I went with light and open. Adding the mirror lightens up the space shop here for more mirrors like this one. For the Bohemian look chandeliers always get the job done, you can find more here. Lastly is decor! In my opinion the bead strands with the tassels really finish off the Bohemian style, you can shop for them here. Adding decor to your Bohemian space, really makes it yours. Using flowers to liven up the space and even a bowl to hold your trinkets in. 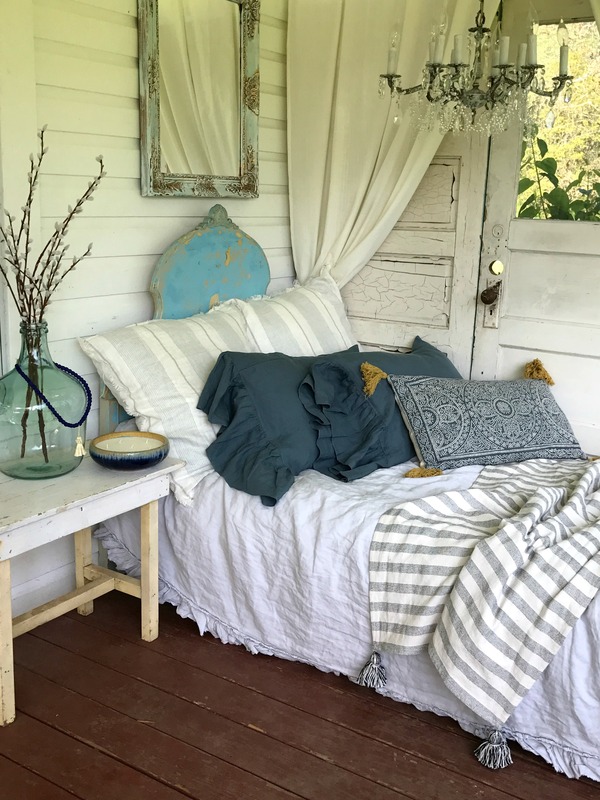 Come check out my shabby chic sleeping porch here for more options. I will include some easy affiliate shopping links below so you can get this style easy. Thanks for these tips for having a bohemian style decor. I like the idea that having solid patterns. It could be fun to see what patterns you could incorporate in your own home and how they could compliment the rest of the room’s design. Youre welcome! A bohemian style is so fun! Is there a specific material we should be on the look out for? I love home decor, and I am thinking of redoing our front room to something more bohemian. And, is there any specific types of furnishing that just match this style better? Thanks! I really like that simple chandelier shown here. It has the ability to transform a normal room into something classy. Something like this would look great in my guest room. Bohemian decor is my favorite. I agree that textiles are the most important part of mastering this style. Bohemian decor is all about texture, especially with furniture and bedding. I like the bedding picture you shared and the different patterns that add texture. I think that the bohemian vibe is hidden in the details – candles, vases, lots of textiles and patterns on the floor and on the furnitures. I like the candle that is next the bed. I like the idea of using a mirror to add to the light and open effect of the decor. My wife has been thinking about redecorating the house and wants to create a general light and happy feel in the house. Thank you so much for the decor tips! Hello I love adding mirrors to the space! I am glad I could help.